We'll look at three simple ways students can add variety to their sentences by changing their opening word. We continue to add variety to writing by changing the beginning of sentences. In this video: "the reason," prepositional phrases, and similes. 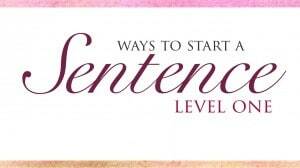 In this third video in a series, we continue adding variety to writing by changing the way we begin sentences.